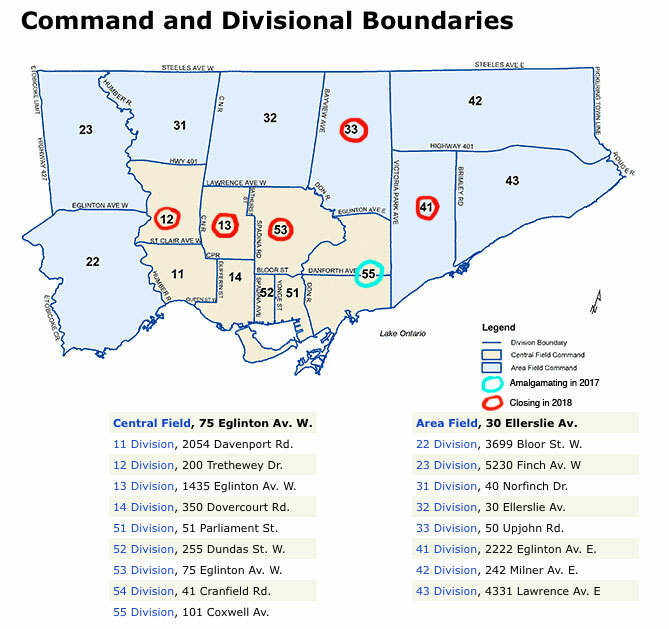 In fact, according to the Interim Report approved at July’s Police Board meeting, 12 Division (along with several others) will disappear as it becomes amalgamated. How that process will work is rather vague. 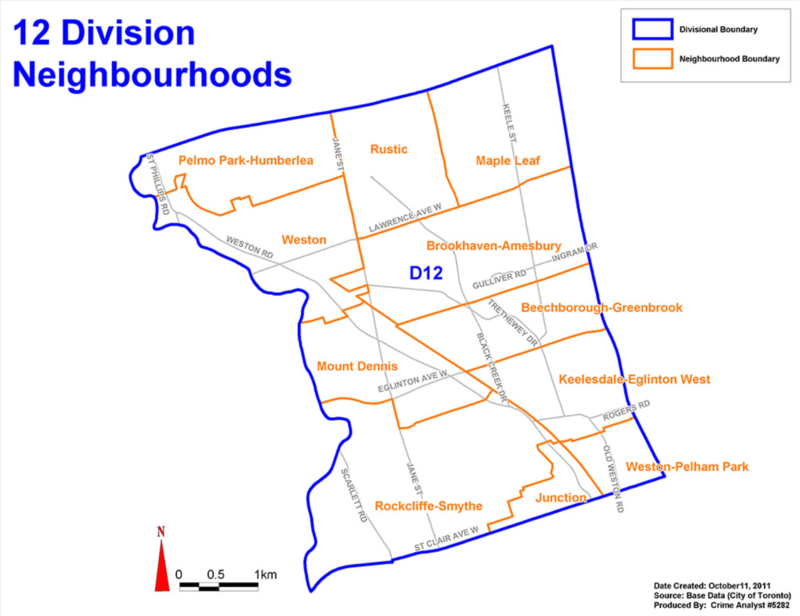 The current boundaries of Toronto Police’s 12 Division. 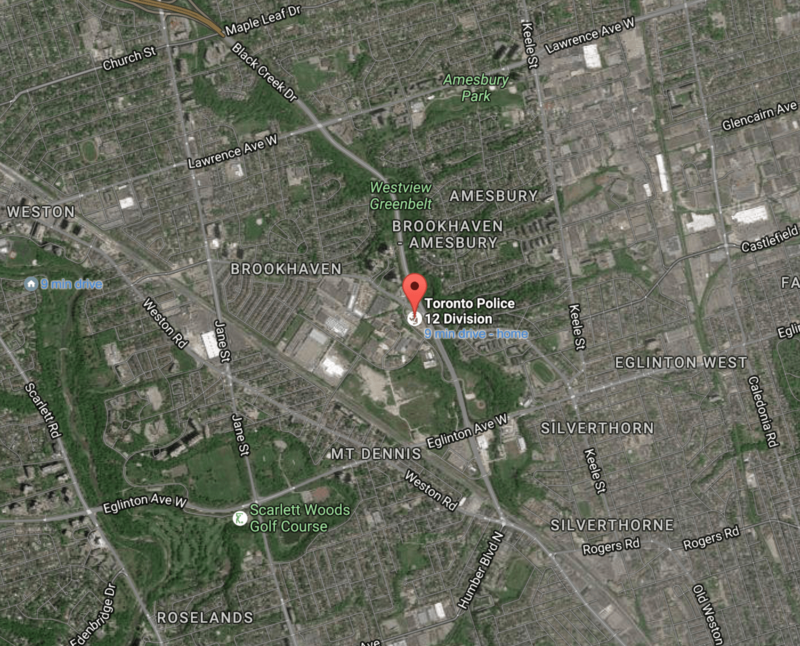 Here’s a look (below) at the affected Toronto police divisions according to CP24. Original map adapted by Roy Murray. Saunders was no doubt hired with the understanding that the billion dollar police budget had to be trimmed, but like his predecessors has dragged his heels. John Tory, mayor of one of the lowest taxed cities in the country is currently asking for a 2.6% across the board budget cut to every city department so he can bring in ‘an at or below inflation’ tax increase. It’s well known that when City budget cuts come, they disproportionally affect the poor along with areas where large numbers of poor people live. User fees go up, services get slashed and the TTC is ordered to cut back on crowded suburban routes. Mayor Tory is simply another slash and burn, subway loving member of Ford nation albeit with a better grip on P.R. (Ignore the bazillion acre park across the rail lands; it’s a distraction). The Mayor and his rich friends don’t like paying property taxes on their mansions and so the poor must bear the burden. 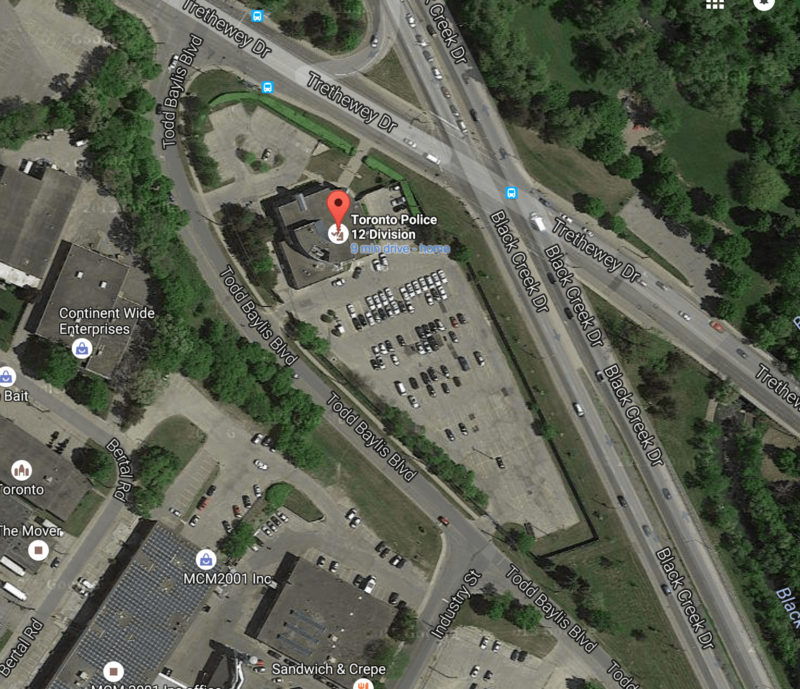 A satellite view of 12 Division HQ. What’s a police chief to do? Learn from the fine example set by politicians and look for savings from people who don’t make as much of a fuss. The police station currently occupied by 12 Division is on a large piece of real estate with excellent highway connections. Wouldn’t it be a great place for a high rise apartment building or two? It even has enough room for parking. Dress the sale up as a ‘modernization of police services’ and police ‘becoming more accessible’ and you have the makings of a fine sales job. Developers must be salivating at prospect of owning the site. Toronto City Council would smooth all hurdles out of the way and the sale of police assets would trim the Chief’s bloated budget for now while being framed as greater contact with the community. Win Win Win! Some key words come in the Chief’s Interim Report executive summary. In the months leading up to our final report, we will continue to look for responsible measures that can yield additional reductions, savings, and real estate returns. Through the redesign of boundaries and facilities, we have identified up to $72 million in real estate that could be returned to the City of Toronto. As we conduct the next phase of our work we will look for other similar opportunities. A close-up of the property. Lots of room for a high rise, great road connections and it even has ample parking. Photo from Google Earth. Given past knowledge of previous public asset sales, developers are no doubt lining up with proposals and part of the deal will have to include a crumb or two for the community. Make no mistake, without a strong community response, 12 Division Headquarters will be sold. Will this be a bad thing? Who knows. Tim Hortons across the street from the station will certainly suffer. It might be a good idea for Chief Saunders and the Mayor to clarify how the consolidation process will take place and what steps will be taken to ensure that community assets are not being turned over to the private sector simply to protect property owners from a long needed tax increase. People also need to feel confident that this is not a back of the napkin job like the Mayor’s fatuous SmartTrack plans and that we aren’t blundering into a chaotic future. Previous Previous post: Parliamentary Reform Meeting with Ahmed Hussen.